What is an Unadjusted Trial Balance? An unadjusted trial balance is a listing of all the business accounts that are going to appear on the financial statements before year-end adjusting journal entries are made. That is why this trial balance is called unadjusted. This is the third step in the accounting cycle. After the all the journal entries are posted to the ledger accounts, the unadjusted trial balance can be prepared. An unadjusted trial balance is displayed in three columns: a column for account names, debits, and credits. Accounts with debit balances are listed in the left column and accounts with credit balances are listed on the right. Accounts are usually listed in order of their account number. Most charts of accounts are numbered in balance sheet order, so the unadjusted trial balance also displays the account numbers in balance sheet order starting with the assets, liabilities, and equity accounts and ending with income and expense accounts. Both the debit and credit columns are calculated at the bottom of a trial balance. As with the accounting equation, these debit and credit totals must always be equal. If they aren’t equal, the trial balance was prepared incorrectly or the journal entries weren’t transferred to the ledger accounts accurately. As with all financial reports, trial balances are always prepared with a heading. Typically, the heading consists of three lines containing the company name, name of the trial balance, and date of the reporting period. Posting accounts to the unadjusted trial balance is quite simple. Basically, each one of the account balances is transferred from the ledger accounts to the trial balance. All accounts with debit balances are listed on the left column and all accounts with credit balances are listed on the right column. That’s all there is to it. 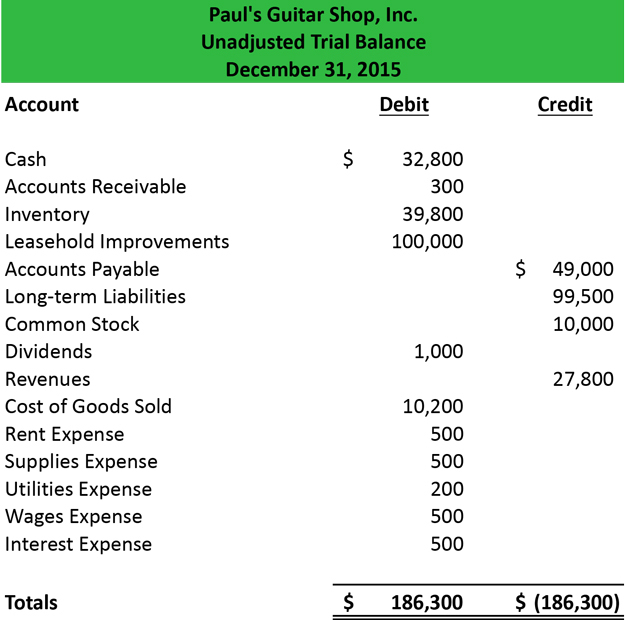 After Paul’s Guitar Shop, Inc. records its journal entries and posts them to ledger accounts, it prepares this unadjusted trial balance. As you can see, all the accounts are listed with their account numbers with corresponding balances. In accordance with double entry accounting, both of the debit and credit columns are equal to each other. Managers and accountants can use this trial balance to easily assess accounts that must be adjusted or changed before the financial statements are prepared. After the accounts are analyzed, the trial balance can be posted to the accounting worksheet and adjusting journal entries can be prepared. 1 What is an Unadjusted Trial Balance?